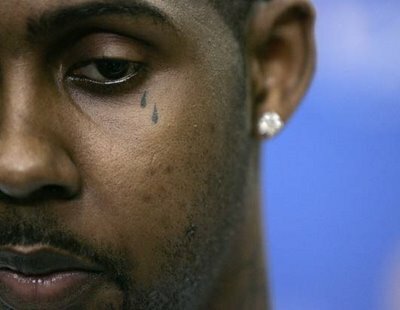 Less than a week after being traded to Sacramento from the Knicks, Larry Hughes has been waived by the Kings. By the Kings. A team in the midst of rebuilding. A team that runs Fat Sean May and a Jewish guy out there every night. They don’t even want Larry sitting on their bench. In case somebody gets injured. Or the High Holidays roll around. The Kings were Larry’s seventh team since being drafted by Philly in 1998. A forefront in the stupid tattoo movement (before JR Smith stole his crown), Larry’s been passed around like a hot potato (with AIDS), never really making a dent on any team, save for a season or two on the Wizards when he showed some promise, at least for the steals category of your fantasy squad. Injuries and his god-awful shooting (which even inspired its own website) have pretty much brought us to this. I don’t know why I say ‘us’ since I have nothing to do with Larry’s career and haven’t for years. And no, I won’t talk about it, so don’t bother asking. The latest word is that Hughes may sign with the Charlotte Bobcats. It seems like everyone is signing with the Bobcats right now. How can they fit all these guys? Do they have a secret roster hiding behind their regular roster? Like a shadow roster or something? Someone should probably look into this.